The Fellowship was fortunate enough to obtain a copy of FEATHERS #1 from BOOM! Studios. Jorge Corona writes and draws. Poe was just a baby when his Pop found him, covered in feathers and squinting at the daylight. Now he’s a growing kid, sneaking out at night to explore the streets of the Maze. On one of his trips he meets a girl about his age, and he helps her get away from the grown-ups. But they’re not safe yet, either of them. Stories about people who are obviously different usually go with the theme of overcoming prejudice. What I like about this story is that this might not be the case. There’s something else going on here that we don’t know about yet (if the narration means anything). And I find that exciting. The art looks good, too; I really like the use of light and darkness in the coloring to emphasize the potential class struggle. Poe and Bianca are starting an adventure, and it’s likely to be a thrilling one. Jump on board and join them, won’t you? 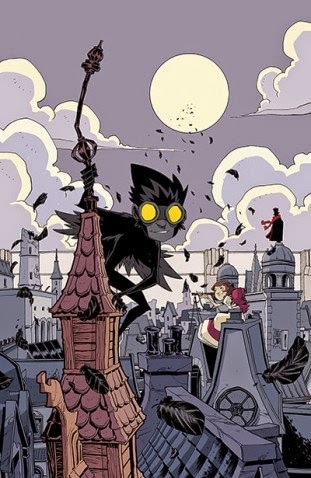 FEATHERS #1 is available now at your FLCS or at boom-studios.com.